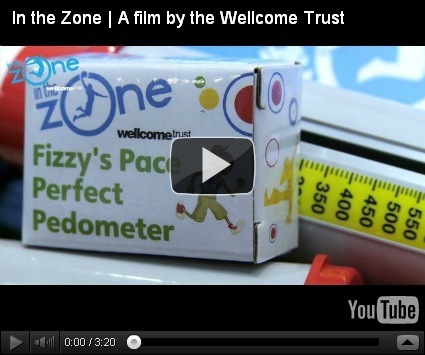 Endorsed by Sir Steve Redgrave, In the Zone aims to engage young people and the general public with the science of how their body works during sport, exercise and movement. I was involved as a member of the advisory group to define the experiments and kit and provide ideas and advice on the interactive touring exhibition. It was a true multidisciplinary effort with experts from a variety of fields from education to textile technology to art. I think the result is amazing and I hope many schools will contact the Wellcome trust to receive the FREE educational kits (you can see them below). Make sure you visit the website http://www.getinthezone.org.uk/ with all the information about this project as well as details on how to obtain the free kits for your school and the dates of the touring exhibition. The initiative will send free science investigation kits for every primary school, secondary school and further education college in the UK. Download the Curriculum Planning Guide – ages 4-11. Investigate balance and find out about different parts of the body. Explore how quick off the mark you are and how many steps you take to do different activities. Discover whether having longer legs helps you to jump further. Find out the effect exercise has on your body and what affects recovery. Download the Curriculum Planning Guide – ages 11-19. Discover how exercise affects your breath and your breathing rate. Explore the strength of your muscles and discover how they are used during movement. Investigate how the cardiovascular system adapts during different exercise or sports. Here is a short movie about the project.